So you’ve transformed your iPad into an endlessly evolving musical instrument iPad Therefore I Rock: 8 Best Sub-$10 iOS Music Making Apps iPad Therefore I Rock: 8 Best Sub-$10 iOS Music Making Apps The iPad is often perceived as a fun yet altogether unnecessary gadget, and that leaves many wondering whether they can justify the purchase when their existing equipment will probably do. Despite being a great eBook... Read More , programmed your own tight drum beats Got Drums? Funkbox Emulates 14 Vintage Drum Machines [iOS] Got Drums? Funkbox Emulates 14 Vintage Drum Machines [iOS] Yesterday I reviewed AudioBus, a system for iOS that allows users to connect compatible music apps together. AudioBus offers a taste of the future when it comes to tactile music creation, but in order to... Read More and discovered the huge potential of AudioBus AudioBus for iOS: The Future of Music Creation Has Arrived AudioBus for iOS: The Future of Music Creation Has Arrived The iPhone, iPad and iPod Touch are no longer toys when it comes to serious music production. No more will your "crippled" iOS devices be restricted to GarageBand when it comes to laying down a... Read More . You’ve sacrificed disk space for samples and your bank balance for virtual analogue warmth – and you’re ready to move on to the next stage. 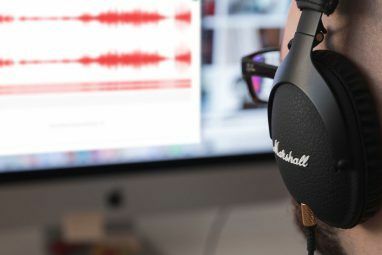 Sticking with the theme of iOS music creation, today’s article highlights some of the best budget digital audio workstations 6 Awesome Alternatives to Audacity for Recording & Editing Audio 6 Awesome Alternatives to Audacity for Recording & Editing Audio There's nothing wrong with Audacity, and we recommend giving it a try if you haven't yet. But alternatives do exist - here are some of the best ones we've found. Read More (DAWs) on the App Store. These apps provide the blank canvas you need to begin putting together your own samples, loops and live recordings, before mixing down and exporting your work. It’s time to lay down a rough mix. Free to try with a ton of in-app purchases, Retronyms’ Tabletop seems like an obvious place to start. The app is designed solely for use on the iPad and after a rather large download of nearly 650MB, you will have the barebones you need to begin producing music. There are 12 included “devices” from keyboards to effect modules, with more available for purchase within the application. Tabletop takes the virtual studio idea to the next level, and approaches inputs and outputs in the same way desktop software like Reason does it, allowing you to create complex chains of effects and triggers. It’s free and most definitely worth checking out if you’re interested in an all-in-one solution, or if you own any Tabletop-compatible apps (at present the AKAI iMPC and iMini). There’s the usual support for AudioCopy and AudioPaste for moving samples between apps, though AudioBus support is currently absent. Tabletop is an attractive tool at this price point, but once you begin to outgrow the included modules you might find yourself spending rather a lot on in-app purchases, when you could put that money towards bigger and better dedicated synths and route everything through AudioBus. Food for thought. 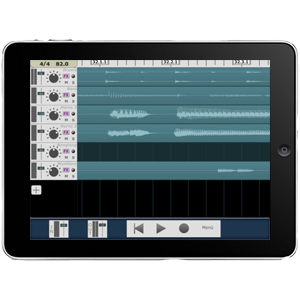 StudioTrack is a barebones multi-track recorder for the iPad. It was developed by Sonoma Wire Works, the team who standardised AudioCopy and AudioPaste, so these features were included from the outset (though there’s still no AudioBus, disappointingly). The Digital Audio Workstation currently supports up to 8 tracks with features like mute, solo, reverb and a range of effects for each. It might be a rather basic on the surface, but StudioTrack includes customisable effects, the ability to record from external inputs, bouncing (re-sampling), accurate meters for mixing and a clutter-free UI that won’t make beginners want to run for the hills. Best of all at $10 it won’t break the bank, though if you’re going to need fine control over 8 tracks or more you might want to look elsewhere. It seems that every time I write an article about iOS and music GarageBand is a mandatory mention 5 Reasons to Spend $5 on GarageBand for iOS [iPad, iPhone, and iPod Touch] 5 Reasons to Spend $5 on GarageBand for iOS [iPad, iPhone, and iPod Touch] Apple’s popular home music production suite GarageBand has been iOS-friendly on the iPad for a while now, and thanks to last month’s update iPhone and iPod Touch users can finally jam along too. This article... Read More , and here it is again. This will be the iOS DAW that most people reach for first, being one of the cheapest ways of repurposing your tablet into a virtual orchestra, drum kit or recording studio. Much like StudioTrack above, GarageBand is limited to 8 simultaneous tracks though Apple included a track merging tool for freeing up space. GarageBand is probably an altogether better deal than many of the other apps on this list, though the lack of serious control over effects, a rather limited mixer implementation and fiddly sample trimming means this is certainly no professional outfit. 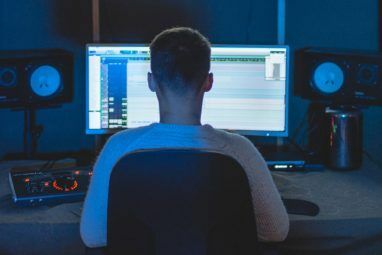 To put it altogether more simply: most of the DAWs on this list might not have half the features included in GarageBand but they’ll outperform it when it comes to the main functions of a digital audio workstation. I’d definitely recommend purchasing GarageBand, just don’t expect to do too much with the timeline editor or mixer functions. Instead you should make use of its guitar amp and stompbox effects for live recording, as well as virtual synths and smart instruments. Now we’re talking – MultiTrack DAW offers up to 24 simultaneous stereo tracks for $9.99, with an optional in-app purchase of $7.99 to add 16 more tracks. That’s a total of 40 stereo tracks, each with its own compressor and equaliser and each capable of recording from the in-built mic, headsets, as well as USB devices like sound cards. There’s a reason that MultiTrack DAW has built up such a loyal following, and that’s down to its simplicity. There are no instruments or generators – this is a tool that is designed for throwing together the grooves, melodies and samples you’ve already made in other apps. With support for AudioCopy as well as AudioBus, monitoring, overdubbing and fine-control over the trimming and arrangement of samples, MultiTrack DAW is a barebones workhorse that does one job, and does it well. Nanostudio is another all-in-one DAW solution that comes with the powerful “Eden” synthesizer and a sampler, as well as a 6-track timeline editor which is upgradeable to 16-tracks for a one-off additional purchase of $4.99. Much like MultiTrack DAW above, Nanostudio has been on the App Store for a while and has developed an army of fans, with positive reviews across the board. Other features include MIDI input, a powerful sequencer for triggering in-built instruments, track effects and AudioCopy and AudioPaste, though AudioBus support is still absent. The features and price make this app ideal for those who want a little more than what MultiTrack DAW provides, though even 16 tracks can feel limiting. If you’re curious and want to know more developers Blip Interactive have made the Mac OS X and Windows versions of Nanostudio free on their website, so you can truly try before you buy. The following DAWs are expensive, and thus probably beyond the interest of casual users. If you are thinking of taking your iOS music making to the next level, you might want to consider paying pretty penny for a lot more oomph. Offering a total of 48 separate tracks, Auria is one of the most complete tools for iOS recording, mastering and mixing. If $50 for an app seems a little steep to you then Auria LE is a lighter edition with only 24 tracks for half the price. This is an app that’s designed to take your desktop PC out of the equation when it comes to making music, check out the video below for the dazzling array of features. Initially known as Fruity Loops and later evolving into FL Studio for the Mac and PC, developers Image-Line have finally unleashed a mobile version of their famous workstation. This tool is ideal for anyone who already uses FL Studio on their desktop as you can export your projects to your PC or Mac and carry on where you left off. 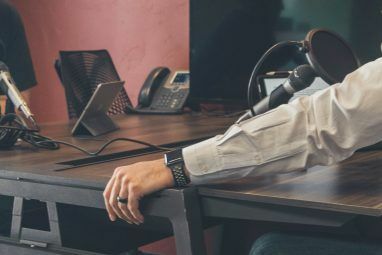 Steinberg made quite a name for itself with software like Cubase and now they’re taking on the mobile market with Cubasis. This app promises “unlimited” audio and MIDI tracks on the latest iDevices, and the ability to export back to Cubase too. A serious tool for those already invested in Steinberg’s other software. Do you use a DAW on your iPhone or iPad? Any recommendations? Share your experience, thoughts and tracks in the comments, below. Explore more about: Audio Editor, Record Audio. All you need is a sound card for your iPhone or iPad, i am a music producer, so i need more than 2-3 audio sources for recording and more than 6-8 for live performance. So i use Focusrite i-track Dock For iPad Air 2 and Tascam iU2 for iPad 2 and iPhone 4S also many other consoles mixers and soundcards connected to laptops and iMacs.. So depend on what you want to do and how. Another good one is (Xewton) Music Studio by Alexander Gross. Unlike many mentioned above, it supports inter-app audio, Audio-Bus, iRig and many others. Additionally, it can automatically upload to SoundCloud or Dropbox at will. FX include filter, compressor, stereo widener, amplifier, delay, bit crusher, limiter, and an equalizer. Additional effects can be added by using inter-app audio. 50 some instruments are included in the standard purchase. There are a total of 116 different instruments, which the remaining 66 can be purchased for only $4.99. You can also add your own instruments by using audio samples and tweaking it in its built-in instrument designer. Lastly, it supports an unlimited amount of tracks that can be exported to and imported from MIDI if so desired. It also works as a great scratch pad too since it can export midi correctly for desktop DAW implementation later. Lastly, Alex is quite active in keeping up with issues and keeping in touch with the users. Overall, for $14.99, its well worth getting if you like making music on the fly. You could also try Instrumental which has integration for the most common digital synths on the market. My kids like it and I use it to mess around with Reason. Sorry to bother you, but I've tried mailing you through your website's contact page, but that didn't work..
My name is Nevine and I work in Belgium, Europe, as a female tv-director.. For the moment I am working on a 5 episodes-during documentary and I'm filming everything with Iphones- and pods (Iphone 4, Ipod touch 5) .It really is a lot of fun, also because the people I am filming (young kids living in Brussels) also tell their own story by filming themselves. So we tell the tv-watching public that it is an "I-doc". It seems that you know a lot about the best accesories for phones. I am filming with an "I-Rig" adapter, with the XLR and a wireless mike. But.. because the App "I-rig" is only for recording audio, you can only monitor the audio through the headphone while recording sound with the Irig app.. The app I am filming with is called FILMIC Pro; it is a great app, because I can choose the filmrate (and change it into 25fps - wich is the European standard). I also have audiometers, can manually choose the focus etc etc.. Question(s); do you know how I can monitor the audio through my headphone while I'm filming? On the adaptor I have right now (the Irig one) there is a leveller, so I can have more or less sound coming in, but I can't hear anything through the headphone I have to "guess" that the sound is right by watching the audiolevels..
Also; do you know if there is ANY possibility to record 2 on 2 channels; let's say for the wireless mike and a small beamer? I have LOTS of other questions, but I will stop here.. I hope I'm not being unpolite by asking you all these ones..